When the countries of Sub-Saharan Africa achieved independence in rapid succession starting with Ghana in 1957, there were high hopes for the region. A group of outstanding leaders would inspire to bring a new era to a sub-continent long suffering from colonial exploitation and developmental neglect. 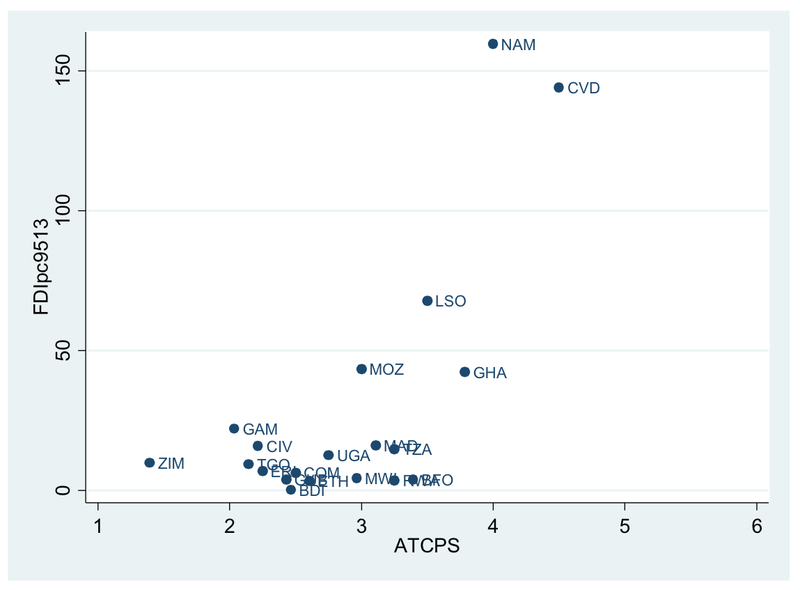 What has happened since has been disappointing: whilst standard economic theory predicts a convergence in economic outcomes, with those countries with lower per capita incomes growing faster than those with higher, there has been divergence, particularly for Sub-Saharan Africa, with incomes per capita in the region stagnating over 1960-2000 (as the gains of the first two decades of that period were wiped out in the next two) and poverty increased when in the rest of the world per capita incomes more than doubled and in some of the most successful developing countries increased four-fold or more (see the figures in Section II). Only the few years before the global economic crisis of 2008 brought respite to this picture of gloom for Africa, as annual growth soared to some 6% during 2006 and 2007, with only the East and South Asian regions exceeding it by a significant margin, but even this period of optimism appears fragile and built on soaring resource prices as much as anything else. This naturally raises the question: Why has the economic growth performance of Sub- Saharan Africa (hereinafter Africa) been so disappointing and more to the point, what are the policy options for reversing that trend? What are the possibilities and policies for Africa to achieve sustained, rapid economic growth and associated structural transformations and begin to catch-up? Africa’s recent growth performance has raised expectations of a bright economic future for the continent after decades of decline. Yet there is a genuine question about whether Africa’s growth can be sustained, and if so, at what level. The balance of the evidence suggests caution on the prospects for high growth. While the region’s fundamentals have improved, the payoffs to macroeconomic stability and improved governance are mainly to foster resilience and lay the groundwork for growth, rather than to generate productivity growth on their own. The traditional engines behind rapid growth, structural change and industrialization, seem to be operating at less than full power. If African countries do achieve growth rates substantially higher, they will have to do so pursuing a growth model that is different from earlier miracles based on industrialization. This might be agriculture-led or services-led growth, but it will look quite different than what we have seen before. The paper is available here: An African Growth Miracle? 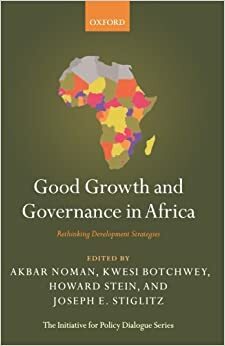 From ‘Good’ to ‘Growth-Enhancing’ Governance: Emerging Research Agendas on Africaʼs Political-Economy. A quarter-century later, sub-Saharan Africa has experienced the most continuous period of economic growth since the 1950s and 1960s. 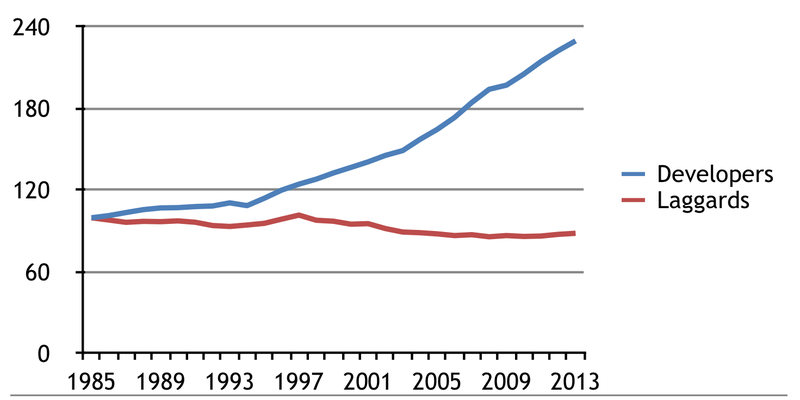 What explains this development: high commodity prices, economic liberalization, better governance and democratization? 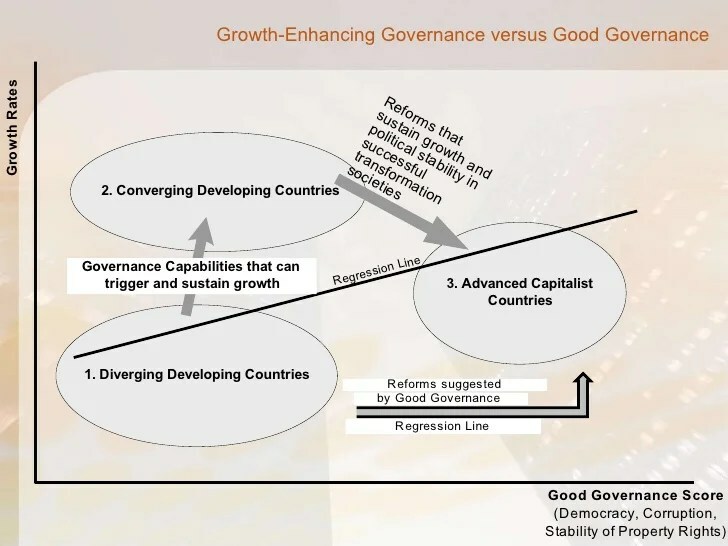 Some development economists, such as Mushtaq Khan, do not see the necessity of implementing the full “good governance agenda” to achieve a turnaround in economic performance. A theoretical framework, “developmental patrimonialism”, has also been advanced by a group of Africa experts to explain authoritarian modernization in a few countries. Blending qualitative and quantitative analyses, Pierre Englebert and Gailyn Portelance move beyond competing analyses. They inquire why relatively small changes in governance in a group of African countries called “developers” (in contrast to “laggards”) has had such a disproportionate impact on economic performance, and notably in attracting foreign direct investment. Their preliminary report and key hypothesis warrant careful study by scholars, policy analysts, and domestic and external investors.2 It can precipitate a wave of incisive research and better understanding of the political economy of contemporary Africa. Over the last year and a half, we have been involved in a research project that addresses some of the questions that have also been central to AfricaPlus since its founding.3. In this contribution we summarize our progress and offer the main hypothesis that our research has generated so far. We address two central questions. 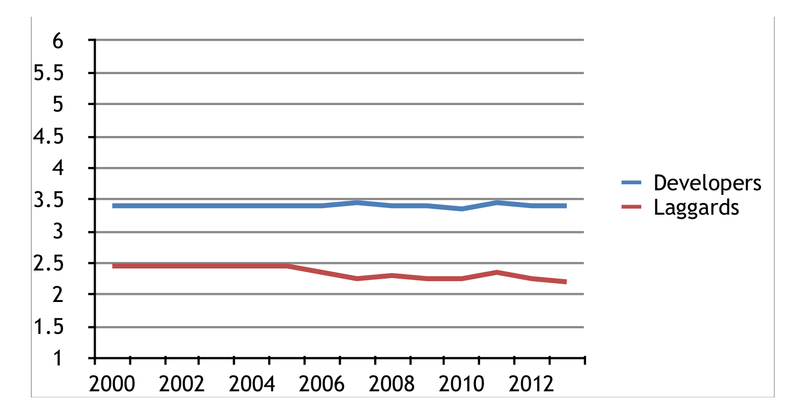 First, is the economic growth of resource-poor African countries linked to improvements in their economic governance? Second, if the answer to the first question is yes, what is the political rationality of such governance improvements? Interestingly, as this research note will hopefully make clear, the answer we found to the first question significantly altered the nature of the second question. A few words of clarification. By economic governance we refer to both rule-of-law type governance (e.g., property rights and corruption) and state or bureaucratic capabilities, or what Mushtaq Khan calls “market-enhancing” and “growth-enhancing” governance.4 The political rationality question addresses what struck us as a potential contradiction between governance-based explanations of African growth and the general understanding of Africa’s previous stagnation as the result of neopatrimonial politics.5 If African politics is based on a neopatrimonial logic of instrumentalization of the state and its resources for political benefit, how can it produce governance improvements without rulers committing political suicide? Did something change in the nature of politics in some African countries that suddenly made such improvements politically feasible? This is an important question because its answer might challenge our understanding of African politics. Much of this work has focused on a few case studies of apparent developmental success stories such as Ethiopia and Rwanda, or successful moments in other countries such as the 1960-75 period in Côte d’Ivoire or the 1964-78 period in Malawi. Ethiopia and Rwanda, particularly, have figured centrally in the discussion of the possibility of developmental statehood in Africa, with the late Ethiopian Prime Minister Meles Zenawi making no secret of the ambitions of his regime in this respect.10 These two countries are, however, in some fundamental ways continental outliers, not least because of their very unique security situations. Having learned a lot from their experiences, we were nevertheless eager to go beyond these specific case studies and try to identify more aggregate patterns, since many more African countries have experienced significant growth. Methodologically, we have limited ourselves to resource-poor countries in order to control for the widespread commodity boom which is responsible for much of the continent’s recent performance. We first ranked all African economies by their rate of per capita economic growth from 2000 to 2013. We then excluded those that derived more than 10% of their GDP from mineral rents. From the remaining countries we selected two “most different” samples: one including the ten fastest growing countries and the other the ten slowest growing. The first group, which we call the “developers,” includes Burkina Faso, Cape Verde, Ethiopia, Ghana, Lesotho, Mozambique, Namibia, Rwanda, Tanzania, and Uganda, and averages 5.33% growth.11 The second group—the “laggards”—comprises Burundi, the Comoros, Côte d’Ivoire, Eritrea, Gambia, Guinea Bissau, Madagascar, Malawi, Togo and Zimbabwe, with a collective growth performance of -0.45%. A visual inspection of their divergent growth trajectories suggests the need for some explanation. Our next step was to ask whether similar differences are observable between these two groups in the realm of governance. 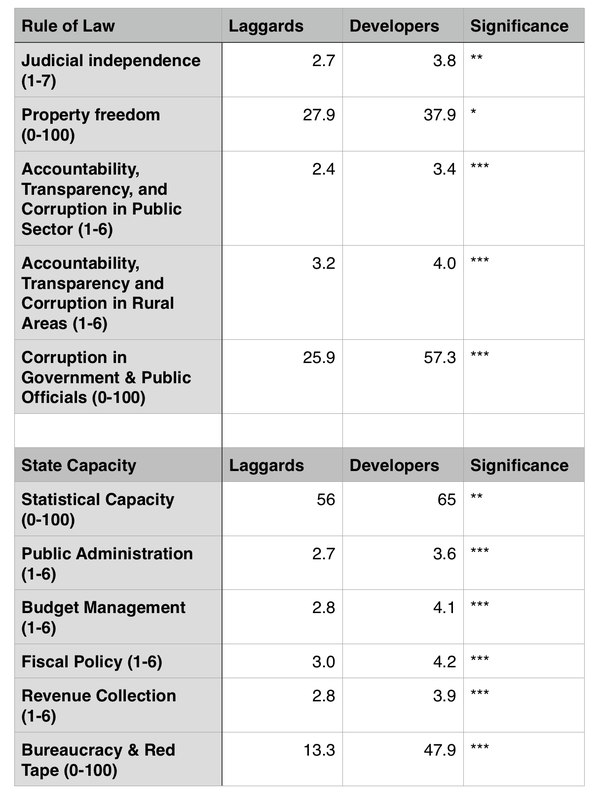 Using raw scores from the Mo Ibrahim Index which seemed more reliable that the usual World Bank aggregate governance indicators,12 we do indeed observe statistically significant variations in some rule-of-law and capacity-type indicators of economic governance. This observation led us to ask when this difference in governance began. Were developers always better than laggards or did they undergo some change in the quality of their governance at some point before 2000. If the difference was always there, then governance might not have much to do with the growth difference between our countries. But if a separation took place at some point before 2000, then it might be related to the increased growth divergence over the same period and it might point to a specific event or set of events that could help us explain the changes. Because the Ibrahim data do not precede 2000, we switched to another source, the Inter-Country Risk Guide (ICRG) from Political Risk Service. While ICRG data are available from the mid-1980s, the indicators are not exactly similar to the Ibrahim variables. Moreover, there are no observations for Cape Verde, Lesotho and Rwanda among the developers, and for Burundi, Comoros and Eritrea among the laggards. Nevertheless, working with what we have and aggregating three different relevant ICRG variables (bureaucratic quality, law and order, and corruption), we found that there was indeed a moment in the first half of the 1990s when developers (which were performing worse than laggards at first) overtook the laggards in terms of governance quality, as the graph below indicates. Both groups then sagged in the second part of the 1990s before stabilizing at fairly constant distance from each other as also indicated by the Ibrahim data. The two main findings are as follows: First, there is a specific moment when differentiation takes place instead of a permanent difference or continuous governance improvements for developers; and second, the performance of developers is good relative to laggards but still below the mid-point in terms of absolute value – in contrast to their growth which is fast in absolute terms. This performance is a far cry from developmental statehood. To what extent does current work on Africa’s growth and governance help us make sense of these patterns in our data? At this stage of the research, we can provide only preliminary and tentative answers to this question. We look here briefly at the apparent merits of three types of argument: the role of democracy, developmental patrimonialism, and the possible effects of security dilemmas. We then move on to explore a new hypothesis which emerged from the data. The most obvious correlation in the time trends is between improvements in governance and the democratization of the early 1990s. This pattern might support the hypothesis that democratization brought about these improvements . The graph below, using Freedom House ‘s inverted scale, shows indeed that laggards are more uniformly non-democratic than developers. 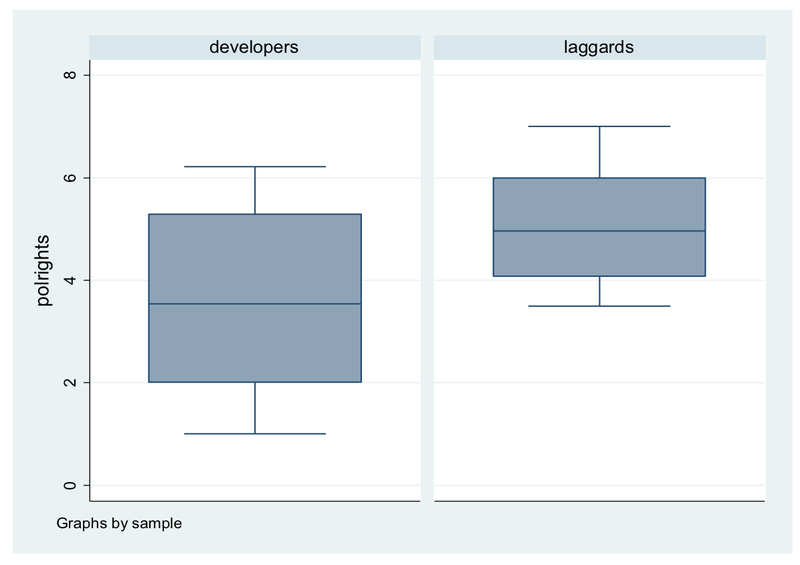 However, the box-plot diagram above also indicates that developers are far from being uniformly democratic (actually, Ethiopia and Rwanda are two of the top three fastest growers). Booth and Cammack have also rather compellingly argued that development is less a principal-agent matter of accountability than one of collective action.17Moreover, while there is consistency in the democratic and governance transformations of the early 1990s, that does not necessarily mean that the former triggered the latter. Both might have been the effect of some other factor. The developmental patrimonialism argument suggests that centralization of rents, long-term horizons and pro-active industrial policy are the hallmarks of developmental regimes in Africa.18 While this model matches Ethiopia and Rwanda fairly well, it is more of a stretch for the other developers in our sample, all of which are closer to the “competitive clientelism” model. The latter, however, is considered inimical to developmental governance. Even the likes of Ghana, Mozambique or Tanzania show relatively little of the proactive control that a developmental state is expected to exert over the economy. And a recent paper by Henning Melber calls the Namibian state “incompetent” rather than developmental.19 It seems to us therefore that the threshold provided by this theory is too high for explaining growth and development in most of Africa. Finally, there is a convincing argument, mostly elaborated in the context of some Asian states, that security threats discipline states into being developmental.20 Again, this argument matches well the conditions of Ethiopia and Rwanda where minority regimes issued from violent conflicts rely on development to generate the legitimacy they need to survive. But, it is once again less of a match with the rest of the sample, although we note that there are a few post-conflict states in our group, including Mozambique, Uganda, and Namibia, but these regimes have not recently faced an existential threat. However, we could see some post-conflict rebound in our data, or maybe the reflection of more structural changes brought about by such violent crises. In the same vein, it is worth noting that there is a large number of post-socialist countries in our “developers” group. While all these theories contain powerful explanatory elements, our data point us towards an additional albeit tentative hypothesis. What bothered us, to some extent, were the high thresholds of state behavior projected by the democratic, developmental-patrimonialism, and security theories. We did not see such transformed or transformative behavior in most of our “developers.” Rather, we saw minimal, almost baby-steps of enhanced governance somehow matched by large improvement in growth. It seemed that a more modest theory was needed to make sense of the economic turnaround in these countries, but one that could also make sense of the large effects of small changes. We wonder to what extent “developers” might be engaged in a signaling exercise aimed at foreign capital. Maybe small but noticeable governance changes, in their bureaucracies and institutions, have been sufficient over the last decade or so to attract large flows of FDI, especially if such changes contrast with the countries that have not introduced them. In an era of low interest rates, these small changes might have been enough to mitigate the perception of risk investors associate with Africa. Their investments might be in some early stages of manufacturing or in the provision of goods and services for African consumers. They can also tap the more limited but still substantial export commodities of some of these countries, particularly agricultural, and they might represent exploration costs in mineral or energy sectors (as in Ghana, Mozambique, Namibia or Tanzania). Interestingly, such marginal changes would be quite possible without any fundamental political restructuring and would thus be compatible with the continuation of neopatrimonial practices. By and large, a different regime can be applied to foreign investors than exists for domestic actors. 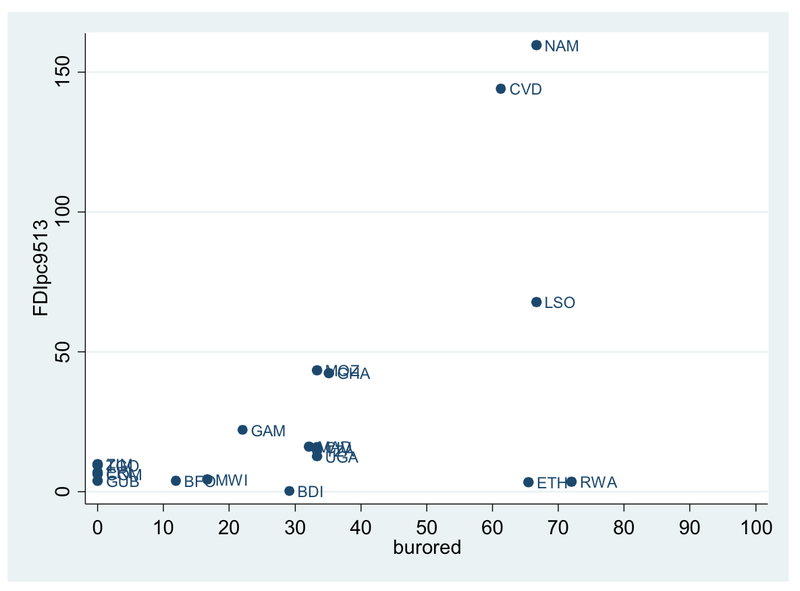 “One-stop shops” and other efficiency islands can be developed to reduce transaction costs for foreign investors and improve the ease of doing business, while prebendal and neopatrimonial logics persist in other state institutions. Such an approach would reproduce the signaling practices of many African countries towards donors. Matt Andrews has shown that a few easy and relatively costless steps are usually taken to get the aid flowing before reforms actually stall.21 It would also be consistent with the “partial reform syndrome” that has been prevalent on the continent.22 More importantly, it would not require any significant changes to neopatrimonial practices (nor much institutional or policy capacity), as it would essentially bifurcate the institutional environment, making governance improvements in some sectors largely aimed at foreigners, while maintaining the same neopatrimonial logic for the rest of the state (and using some of the resources derived from the foreign sector to feed redistribution in the domestic one). In this respect, the similarity between the logic and timing of governance and democratic reforms might not be particularly causal. They might both derive, on average, from the same signaling logic and might both preserve in the end, rather than reform, neopatrimonialism. Although it must be emphasized that this hypothesis is at a preliminary stage, the combined data from both groups of countries is consistent with such a signaling argument. As we mentioned earlier, and the two graphs below illustrate, “developers” do not perform particularly well in absolute value. However, once countries pass a minimal threshold of differentiation with the performance of “laggards”, there is a visible FDI response. In conclusion, we suspect that the economic turnaround in Africa’s resource-poor countries might derive from marginal and politically affordable governance changes largely geared towards attracting FDI without undermining the redistributive logic of domestic politics. If this hypothesis turns out to be accurate, then such strategies might be tested by likely changes in monetary policy in the West which could affect the cost-benefit calculus of investors. Once again, our findings are preliminary and we offer them in the hope of contributing to discussions of this important topic. In summarizing our findings here, we have glossed over some nuances and variations. The next stage of this research will involve refining the quantitative work, breaking down the nature and sectors of foreign direct investments, developing qualitative narratives of governance reforms in “developers” to further examine the signaling hypothesis, and implementing other useful suggestions that readers of this blog will be kind enough to share with us. “The Political Adjustment of Politics in Africa,” World Development, 18, 7 (1990). The full title of the draft paper from which this essay is derived is ‘Small steps for Governance but a Giant Leap for Development? The Politics of Growth in Resource-Poor African Countries’. Some of these preliminary findings were presented at the African Studies Association annual meeting in Indianapolis, Indiana, this past November. For example, see https://africaplus.wordpress.com/2013/07/03/governance-and-economic-growth-in-africa-rethinking-the-conventional-paradigm/ andhttps://africaplus.wordpress.com/2014/04/03/africas-third-liberation-transitions-to-inclusive-growth-and-developmental-governance/. Mushtaq Khan. “Governance and Growth: History, Ideology, and Methods of Proof.” In Akbar Noman et al (eds.). Good Growth and Governance in Africa: Rethinking Development Strategies. Oxford University Press, 2012, 51-79. E.g., Michael Bratton and Nicolas van de Walle. Democratic Experiments in Africa.Cambridge University Press, 1997; Richard Joseph. Democracy and Prebendal Politics in Nigeria. Cambridge University Press, 1987; Richard Sandbrook, “The State and Economic Stagnation in Tropical Africa.” World Development, 1986, 14(3): 319-332. Steven Radelet. Emerging Africa: How 17 Countries Are Leading the Way.Washington, DC: Center for Global Development, 2010; Peter Lewis. “Democracy and Economic Performance.” In Ellen Lust and Stephen Ndegwa (eds.). Governing Arica’s Changing Societies: Dynamics of Reform. Lynne Rienner Publishers, 2012, 45-72. Ann Pitcher, Mary Moran and Michael Johnston. “Rethinking Patrimonialism and Neopatrimonialism in Africa,” African Studies Review, 2009, 52(1):125-156; Daniel Bach and Mamoudou Gazibo. Neopatrimonialism in Africa and Beyond.London: Routledge, 2012. Tim Kelsall. Business, Politics and the State in Africa. London: Zed Books 2013; Booth, David and Fred Golooba-Mutebi. “Developmental Patrimonialism? The Case of Rwanda.” African Affairs, July 2012, 111(444): 379-403. Hazel Gray and Lindsay Whitfield. “Reframing African Political Economy: Clientelism, Rents and Accumulation as Drivers of Capitalist Transformation.” London School of Economics: Working Paper Series 14-159, October 2014. Meles Zenawi. “States and Markets: Neoliberal Limitations and the Case for a Developmental State.” In Noman et al. op.cit., 140-174. We did not include Liberia because of the role of donors in its economic performance, which has disconnected policy choices from domestic political realities. See Amos Sawyer. “Emerging Patterns in Liberia’s Post-Conflict Politics,”African Affairs, 2008, 107(427):180; and Radelet, op.cit., 7.
http://www.moibrahimfoundation.org/interact/. The index starts in 2000, but not all indicators have data for every year. We average data for available years. Ibrahim extrapolates this indicator backwards from 2006 to 2000, hence the straight line over that period, but the trend is similar for those that have actual data going back to 2000. Peter Lewis, op.cit., 47-48; Radelet, op.cit. Bratton and van de Walle, op.cit. ; Lewis, op. cit. Anne Pitcher. Party Politics and Economic Reform in Africa’s Democracies.Cambridge University Press, 2012. David Booth and Diana Cammack. Governance for Development in Africa: Solving Collective Action Problems. London: Zed Books, 2013. Kelsall, op.cit., inspired by the work of Khan. Henning Melber, “The Namibian State of Development: Evidence for a Developmental State?” Paper presented at the 2014 meeting of the African Studies Association, Indianapolis, Indiana. Richard F. Doner, Bryan K. Ritchie and Dan Slater. “Systemic Vulnerability and the Origins of Developmental States: Northeast and Southeast Asia in Comparative Perspective,” International Organization, 2005, 59, 327-361. Matt Andrews. The Limits of Institutional Reform in Development: Changing Rules for Realistic Solutions. Cambridge University Press, 2013. Nicolas van de Walle. African Economies and the Politics of Permanent Crisis, 1979-1999. Cambridge University Press.